From the Ancient Greek "Father of Geometry" to 20th century Leeds, drop into the Treasures of Brotherton Gallery to discover some of the highlights of our maths and science collections. Are you curious about calculus? Impassioned by innovation? Come along to the Gallery and explore highlights from our maths and science collections. 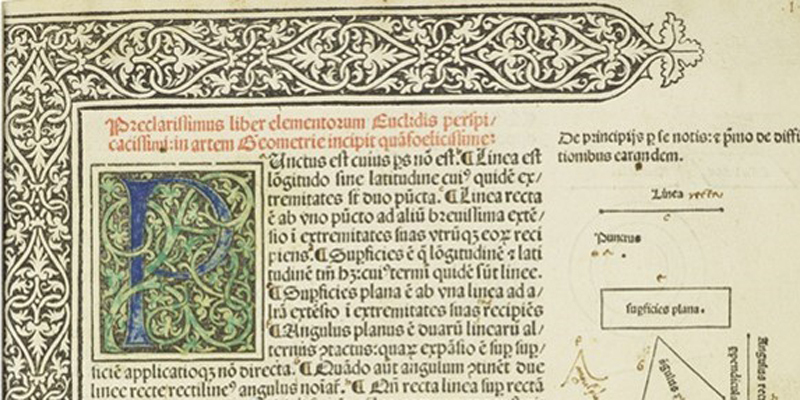 Brush up on your geometry and arithmetic from early printed books. Explore 20th century archives of Leeds-based scientists and their experimental work. In April's Tuesday Treasure, discover the important historical works in these fascinating collections and the scientific innovations pioneered here at the University of Leeds.